PS We're Getting Married: Four Months! There are four months left! I can't believe it! Up until this point, I've gotten our major vendors taken care of, made sure to keep the family in the loop, and do my best to keep our vision steady. Now, it's crunch time! 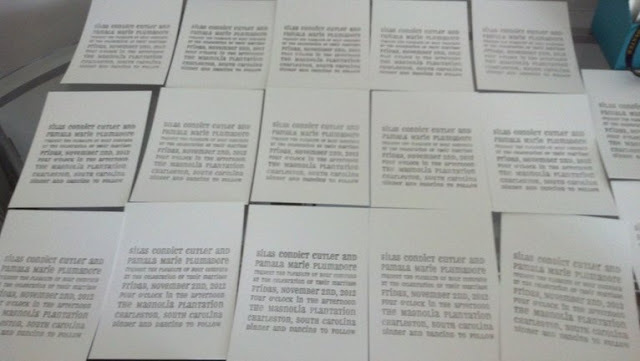 I took this week off to tackle a variety of wedding projects, starting with letterpressing our invites! Currently, our 55 invites are drying in the other room. Stay tuned for photos after the invites go out next month and the RSVP's start rolling in, but here's a sneak peek! Place the full order for our paper lanterns. Order the tissue paper for our hanging poms. Continue with our yarn wrapped bottles. Get the custom maps that will serve as our "inner envelopes" printed and folded. Finish up all of our dessert stands! Stay tuned for more wedding madness!